– Supporting small businesses in your community helps the local economy. – Avoid mall crowds! My decision to shop local this holiday season was cemented when I spent an hour shopping with a friend at the Rideau Centre on Sunday. So freaking crowded! 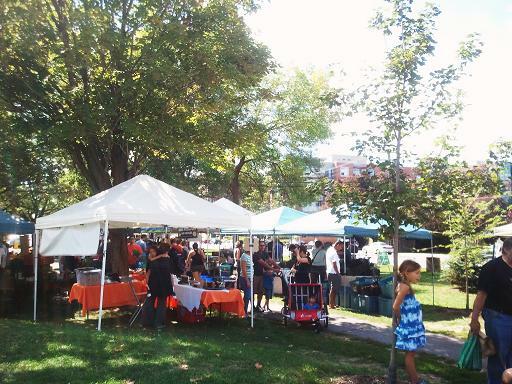 The Westboro Farmer’s Market – So Freaking Excited! This past Saturday I went to the newly established Westboro Farmer’s Market for the first time. I love farmer’s markets, so when I heard the Ottawa Farmer’s Market was starting one in Westboro, within walking distance from my house, I couldn’t wait to go! I love walking among the vendors and seeing new recipe possibilities in all the bright coloured seasonal produce. I especially adore the Ottawa Farmer’s Market because the vendors are all local farmers or producers whose products must be grown or produced within 100km of the city of Ottawa. Many other markets in the city allow resellers (i.e. they don’t actually grow or produce the products they sell), although Savour Ottawa does have signs at the Parkdale and Byward Markets alerting shoppers as to whether a vendor is a reseller or farmer/producer. I chatted with some folks from Waratah Downs, where we currently get our CSA basket. They said foot traffic has been steady, but sales are low relative to the amount of shoppers. Seems like a lot of people are interested in the market, but not ready to put their money where their mouth is yet. So I felt a little guilty, and bought a watermelon. Let’s be honest, I don’t need an excuses to buy from a farmer’s market, I’m usually limited only by the amount of cash in my wallet or amount of produce I can carry – whichever comes first! So I also bought a snack, because that could be eaten and didn’t need to be carried back. 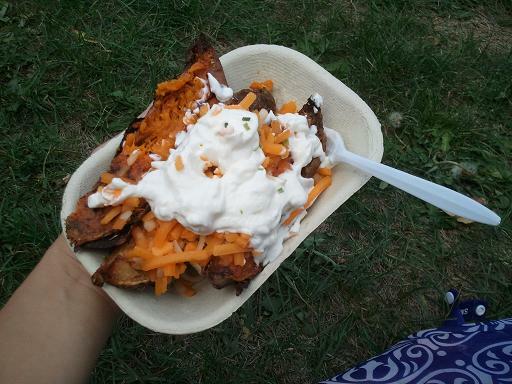 I had potato wedges from The Hot Potato Company – they were amazing! I chose a combination of regular and sweet potatoes, topped with cheese and sour cream. I’ve also had their garlic sauce in the past, which is also delicious.